It is astonishing to see how many lives Srila Prabhupada had touched, even before he came to the West as acarya. It is a tribute to the potency of his expansive affection that so many different kinds of people were significantly transformed by his association. 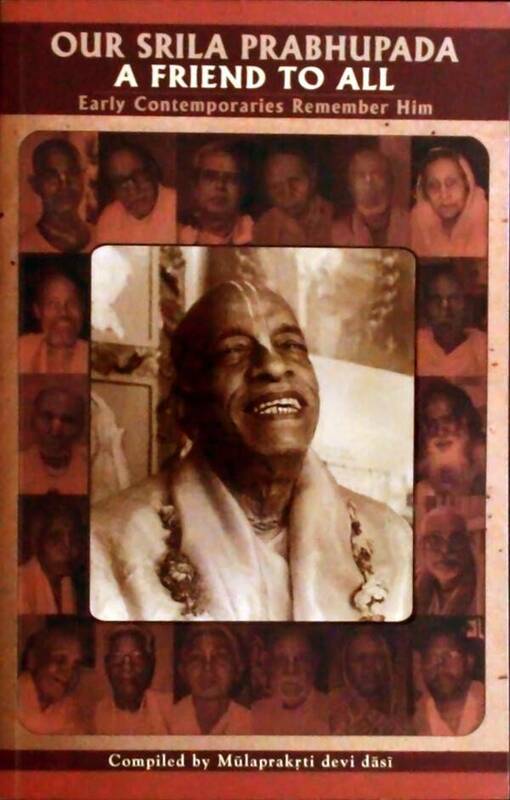 Format: paperback, 9" x 7"
It has taken well over eight years to collect this array of memories of my spiritual master, His Divine Grace Srila A.C. Bhaktivedanta Swami Prabhupada. I first became interested in the subject of Srila Prabhupada and his relationships with his early friends over twenty years ago, when several of them spontaneously recalled such beautiful memories that I felt my enthusiasm to know Srila Prabhupada increase. Over the years, on frequent travels throughout India, and especially while residing in Vrndavan near Srila Prabhupada's rooms at Radha Damodara Mandira, I came across many Vaisnavas who had known Srila Prabhupada before he left for the West. I questioned them and informally noted their accounts. A pattern emerged. Almost every story I heard from these elderly sadhus, friends, admirers and family members left me feeling more appreciative of Srila Prabhupada's unique position. As I shared my experiences with godbrothers and godsisters, it became obvious that these sweet Prabhupada memories might be a gold mine of inspiration to Srila Prabhupada's followers everywhere. I realized a book would be the natural outcome of my research. Thus, the detective work began, and over the last eight years we picked up every clue and name we could. A search was conducted for anyone who knew him. Gradually, the book took on a life of its own. It is astonishing to see how many lives Srila Prabhupada had touched, even before he came to the West as acarya. It is a tribute to the potency of his expansive affection that so many different kinds of people were significantly transformed by his association. I can't imagine what would have been the length of this book if we had started years earlier when so many of his most intimate associates were still alive. Many who knew him will never be heard from, as they passed on before they could be contacted. Even among those whose words we recorded, many are now no longer with us. Some of the interviews were conducted in English, but most were translated from Hindi or Bengali. On occasion, some information has been culled from previously written or recorded material. Most of the interviewees were quite elderly. Many are advanced devotees in their own right, and some are also revered acaryas of their own missions. Others are simple fortunate souls who have been touched by Srila Prabhupada's kindness and compassion. To show how Srila Prabhupada touched all those with whom he had contact, we have included a variety of interviews with people of very diverse backgrounds. Some of our interviews are brief snapshots of memory; others are quite extensive. They also may not all be equal as exchanges of substance or depth. But despite these differences, the common ground is that each on of our interviewees felt moved, touched or blessed in a personal and profound way. What we have heard from these people has inspired us to further appreciate the depth of Srila Prabhupada's character and devotion. It has clearly left us with a more profound insight into his universal love and affection. Our simple motive is that all who read these pages will receive this same result. Although this is just a drop in the ocean of his glories, we hope it will encourage those who thirst year after year, life after life, for his precious company and service. A question may arise regarding the authenticity of the recollections gathered here. The frailty of human memory and tendency toward motivation are obvious possible defects. Nevertheless, in previous publications about Srila Prabhupada, individual memories equally difficult to verify have also been used. These are oral histories, not legal documents. We have cross-referenced and corroborated whenever possible to ensure validity, and interviews in question were either not included or re-conducted. We apologize for any mistakes, but ultimately this book is not meant to be biographical history; it is purely inspirational. We attest that each of the people whose interviews we've finally selected spoke solely to glorify Srila Prabhupada. Many, if not most, were shy and only came forward with continued coaxing. Some were emotional, and a few even broke down with feeling, unable to continue, as they fondly remembered him. Many of the contributors knew of the other order of Srila Bhaktisiddhanta Saraswati Thakur Prabhupada that was upon him. But certainly none knew the miracle that was to come. However, all of us, his countless followers whose live are part of this miracle, can now see in retrospect the preview these interviews offer with regard to his true potency and glory.